Will a Smart Gun Save My Life? Is the mainstream ready for so-called Smart Guns, or can this technology be hacked, and used against us in this new digital world? Disclaimer: This feature article will only focus on small firearms, and not military applications of smart gun technology. RadarZero does not condone gun violence, or represent any of the companies listed in this article. Be Safe. Be Aware. Imagine a world where you cannot fire a gun if you're not the gun owner because the gun is a smart-gun which is mapped to a specific person. Today, we have this technology in most modern phones, and we have PC or smart doors all equipped with embedding biometrics such as fingerprint readers and RFID (radio frequency identification) technology to unlock the weapon. Smart-guns were introduced by a National Institute of Justice (NIJ) study that recommended a technological approach to help reduce the incidence of police officers killed by assailants. Since then, smart-gun technology has been around, but this technology has not reached mass production, or mainstream. 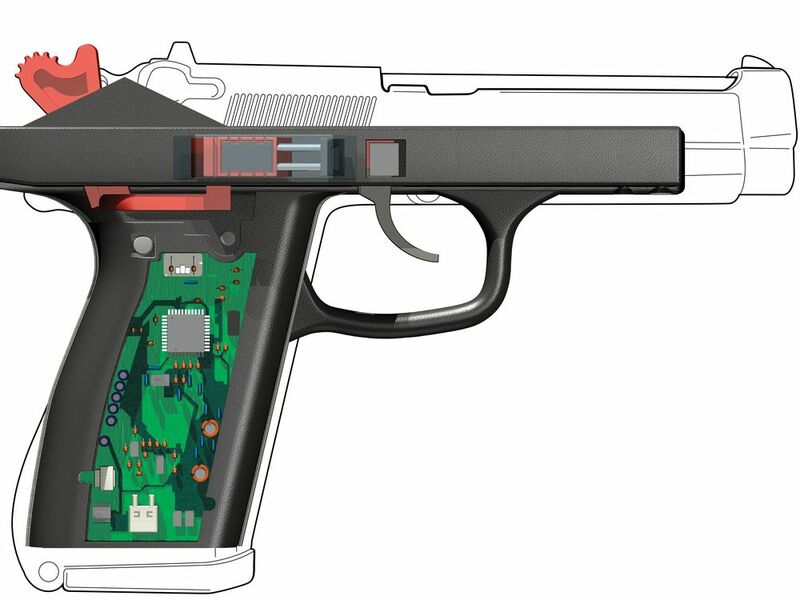 These 'smart-guns' have small embedded computers/chips which enhance the security and preventative measures to prevent misuse, accidental shootings, gun thefts, and use of the weapon against the owner. One would think that this is a perfect solution to gun related crimes and deaths, but it's not going to end all gun crimes, but it will certainly reduce them. The Stats: In the United States gun crime is significant, and that is because Americans have the highest concentration of privately owned weapons in the world. 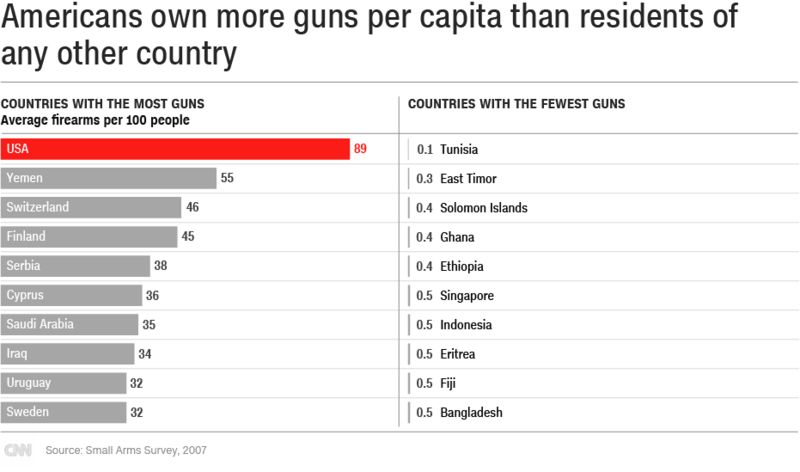 It goes without saying, more guns mean more deaths. The US has up-to six times more homicides than Canada, and 16 times more than Germany. The media is full of stories, and it's heartbreaking to hear of accidental gun deaths caused by children. In June 2017 a six-year-old accidentally shot and killed a four-year-old, or another story where a boy was shot in Mississippi. The journal Pediatrics has conducted a study and has shown that an average of 5790 children have required medical attention relating to gun injuries, with up-to 21% of those cases as reported as unintentional, and an average of 1300 children die every year from gun-related deaths. This now makes guns the third-leading cause of death for children in America (behind illnesses and unintentional injuries). 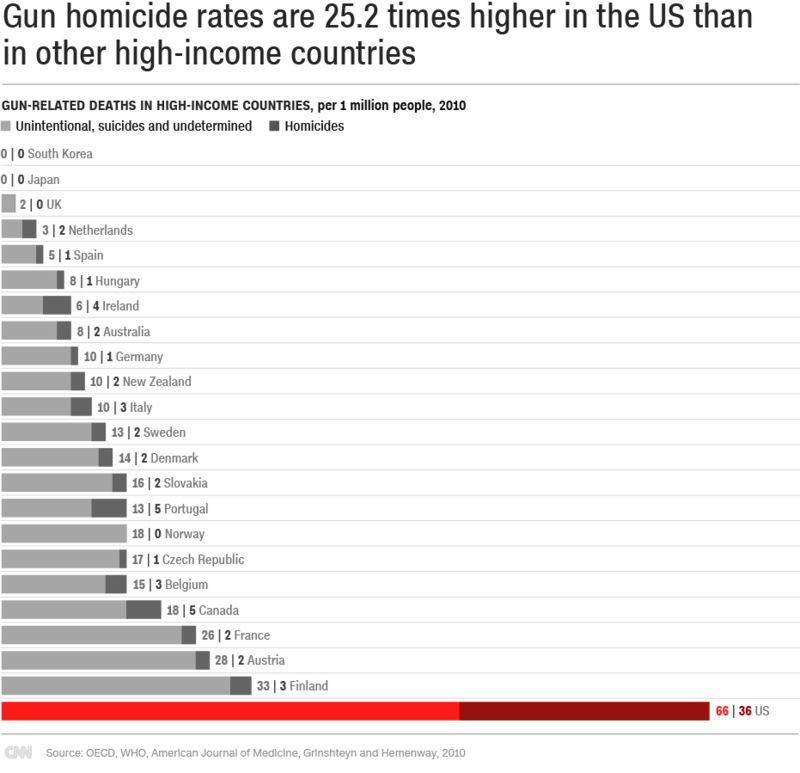 According to a study, Violent Death Rates: The US Compared with Other High-income OECD Countries, 2010 the US, accounts for 91% of children killed by guns in high-income countries. Intentional Homicide: USA Today recently published an article on 'March for Our Lives could be the biggest single-day protest in D.C.'s history'. The article estimated that up-to 800,000 students would be demonstrating and advocating gun control. This was a direct response to the Stoneman Douglas High School Massacre which took place in Parkland, Florida and resulted in the deaths of 17 people. In the US alone, school shootings or massacres occur too often for comfort, and one would believe that if preventative measures (such as smart-gun tech), could/should block young adolescents, with psychological, or social problems, to access these weapons and use them to cause harm. Some politicians are listing though, Florida Gov. Rick Scott signed Senate Bill 7026 into law last week, the first gun control legislation in the state after the massacre. In Alabama, a 11-year-old school boy shoots a suspected home invader by accessing his step father's gun and according to the article, the boy was threatened by the intruder, so he shot him. This story could have been written a different way, "an 11-year-old boy was found dead in his home, while his parents were away"...Gun control, or access to guns is a complicated matter and it's not as simple as we would like it to be. Brief History of Smart Guns: Back in 1994 the US Congress funds Sandia National Labs to study if smart guns can help lower the rate of police killed with their own weapon during a struggle. In 1990s Colt built a prototype smart-gun, which needed a 'special ring'. In 2000, Smith & Wesson announced that they would release guns with high-tech safety features, but due to boycotts by gun activiists, both companies withdrew the tech from the marketm and Smith & Wesson had to lay off 15% of its staff. In Colt's version, the weapon only functioned when the user wears a smart-watch which had a transponder, and this transponder sends a signal to the weapon's magazine in order to 'activate' the weapon. However, due to pressure from pro NRA groups, who went on to boycott the manufacturers, and surprisingly some criticism from the police, Colt and Smith & Wesson both decided to withdraw the 'smart gun' program for fear of damaging its brand and politics. Is mainstream ready for Smart Guns, or can this technology be hacked, and used against us in this new digital world? Gun Reliability: The most important aspect of owning or purchasing a gun, is its reliability to work, all the time. For whatever application use; at the gun range, hunting, law enforcement or military use, a gun when used must work. Period. Smart-Guns are not an elixir, or a promise that they will work and provide the safety that they promise to provide and we now have sufficient history of ruggedised circuitry that failure rates do occur. The Politics: The debate of 'smart guns' could have a major impact, in the state of New Jersey, a new Legislation has been passed on smart-gun technology, and in Washington a U.S. Senator has considering introducing a bill that would apply an even stricter law throughout the nation and in 2016, President Obama released a memorandum on gun violence which included specific recommendations on federal actions designed to promote the development and commercialisation of electronic gun-safety systems. But not everyone agrees with the technology. The first generation of smart-guns have limitations. Pro-gun lobby group, the National Rifle Association has an entirely different view on smart-guns, they claim that 'they do not oppose the technology', but their fears are that the technology will lead to a rise in costs, and the guns could be deactivated remotely against their constitutional right. In article written by TechCrunch, the NRA have said that they are afraid that once a seemingly viable smart gun technology exists, anti-gun legislators at the state and federal levels will attempt to mandate it in all future guns by comparing it to other product safety features. Law Enforcement: Law enforcement have a mixed view towards smart guns, one being if a police officer picks up a smart gun, which is not his/her own, the gun wont fire. While another group, the anti-gun-violence campaign connected to the Metro Industrial Areas Foundation, says "it has 80 law enforcement agencies interested in the technology." The risks: Joseph Steinberg wrote an article for Forbes and his view is that "biometrics take time to process and are often inaccurate – especially when a user is under duress – as is likely going to be the case in any situation in which he needs to brandish a gun.... it is not ideal to add a requirement for power to devices utilised in cases of emergency that did not need electricity previously. How many fire codes allow fire extinguishers that require a battery to operate?" Steinberg further adds that "smart-guns might be hackable" or "susceptible to government tracking or jamming...Firearms must be able to be disassembled in order to be cleaned and maintained. One of the principles of information security is that someone who has physical access to a machine can undermine its security." Biometrics Scanners: Biometrics are automated methods of recognising a person based on a physiological or behavioural characteristic. Among the features deployed for smart-gun are fingerprints and hand geometry. While this technology does provide some level of access, as we have seen for mobile phones and personal computers, we are all aware that sometimes the tech does not work. Alternatively, in a stressful state, for example; when a user is 'sweating', or a police officer has been running, the biometric scanner could fail to read the operators fingerprints. Kodiak Arms and Safe Gun Technology’s retrofit for rifles use fingerprint detection as a primary mode of security to unlock guns. Electronic Guns Require a Power Source: The use of electronics for any device, means a power source is required, and smart-guns are no different as they need batteries to power up the various safety systems. But advances in microprocessor technology and battery storage driven by smart phones and portable electronics manufacturers are creating innovative software solutions. If the battery dies, the gun could fail to fire. Smart-guns that have been designed for civilian use have intentionally been designed to fail when the battery is depleted, however for law enforcement it has been suggested that when the battery fails, this feature should be disabled and that the gun should still be operable. Aided Guns with (RFID) & Smart Watch: RFID (Radio-Frequency Identification) uses radio waves to read and capture information stored on a token linked to an object, like a ring or watch. According to Smart Tech Foundation they describe that most RFID firearms designs for personalised handguns, the token can unlock the trigger within a few inches of the firearm. When not in close proximity to the token, the firearm stays completely secure to prevent others—especially children—from accidentally firing it. The response time of these systems is dependent on the electromechanical components used (e.g., servomotors, solenoids), but in genarel have been recorded at less than half a second. By design, the gun can remain active as long as there is a signal link, or in some configurations as long as pressure sensors detect the gun is being held. A number of working RFID prototype guns have been demonstrated, beginning with Colt’s 1996 handgun and including Triggersmart, iGun M-2000 and the Armatix iP1 and some of these models can be purchased today. See: Anybody can fire this 'locked smart-gun with $15 with of magnets. Malfunction: Lets face it, electronics fail all the time. The smart-gun could be dropped and this could damage the circuits, or for whatever reason a chip on the board simply fails, and the smart-gun simple wont work. Law enforcement, and civilians need a firearm that always work, all the time. TechCrunch journalist Jon Stokes summarises the reliability concerns with smart guns stating,"First, no electronic technology is 100% reliable, and very few people will trust a gun that can be turned into a brick by a failure of some on-board circuitry. Second, whenever you attach software to some new category of things — especially software that has any kind of connection to the outside world, whether via RFID or an actual network"
Conclusion: While a smart-gun sounds great on paper, I am left concerned that the current first generation of weapons do not provide a fully workable solution, and it's a risk that if I needed a weapon for protection, I would want a weapon that works 100% of the time. Second Generation smart-guns are in development, according to research by New Jersey Institute of Technology they have developed a gun safety system based on behavioural biometric system known as Dynamic Grip Recognition (DGR) which can detect grip patterns during the first 1/10th of a second of trigger pull and unlocks the weapon with no apparent lag to the shooter. Accidental or intentional deaths of people caused by guns opens a much bigger debate on gun storage, gun ethics and gun laws, and I think that society as this moment should explore this avenue further. Smart-guns are coming, I absolutely believe that, but the technology is still not reliable to a degree that it should be deployed on a mass scale. But would it solve the current needless death? I dont think so. I mean looking at statistics, there are currently over 300 Million guns in the US, that are NOT smart-guns, so how would those guns be pulled from circulation, and replaced with smart-guns? That's a question that I would leave law makers and society to solve. Defense Distributed, a non-profit organisation that was launched by Cody Wilson publishes open source gun designs that can be downloaded and created with a 3-D printer.